Zoom in, pan to the far left and below center to see what appears to be a non-cataloged LSB (low surface brightness) dwarf galaxy, that may be associated with NGC 891. These little guys are everywhere, but difficult to get pro observatory telescope time allocated for their study. They are interesting, in that they seem to contain very significant amounts of dark matter. This object can also be found in the SDSS-II images. 12.5" RCOS @ ~f/9 (2880 mm fl) 0.643 arcsec / pixel. Zoomify image scale is 0.86 to 3.44 arcsec / pixel. 10/24/2009 to 11/22/2009 Chino Valley, AZ... with CCDAutoPilot3 & CCDSoft. eXcalibrator for (b-v) color calibration, using 15 stars from the NOMAD1 database. 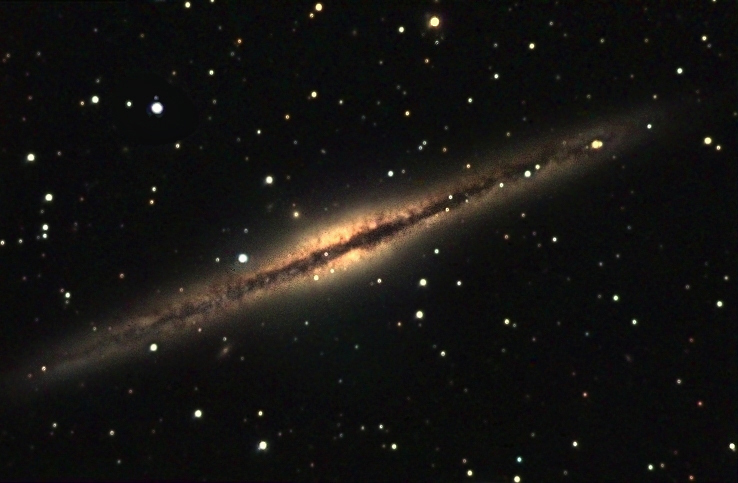 Discovered on October 6, 1784 by William Herschel, NGC 891 is about 30 million light-years way in the constellation Andromeda. 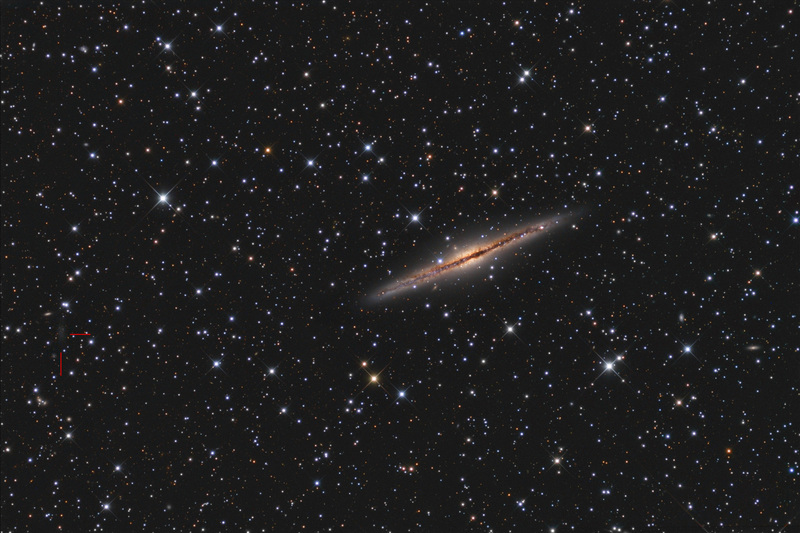 From our perspective the unbarred spiral galaxy presents a beautiful edge on view. Celestron C11 @ ~f/10.5 (~2930 mm fl) 1.27 arcsec / pixel. Shown resampled to 1.58 arcsec / pixel. Click the image for a full size wide field view. Discovered by William Herschel in 1784. 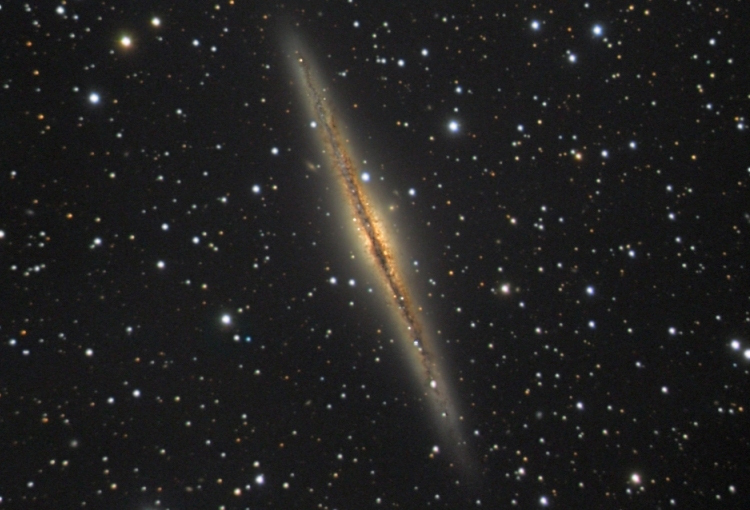 NGC 891 is at a distance of 30 Million Light Years.